Have a blast with this space-themed slot from British software provider iSoftBet. 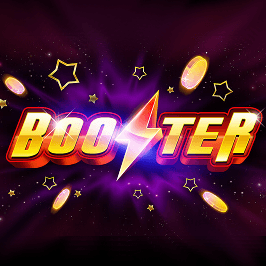 Booster is a straightforward online slot machine with the conventional five reels and 25 paylines, as well as a bonus feature in which you can win a range of prizes including coins, free spins and multipliers. 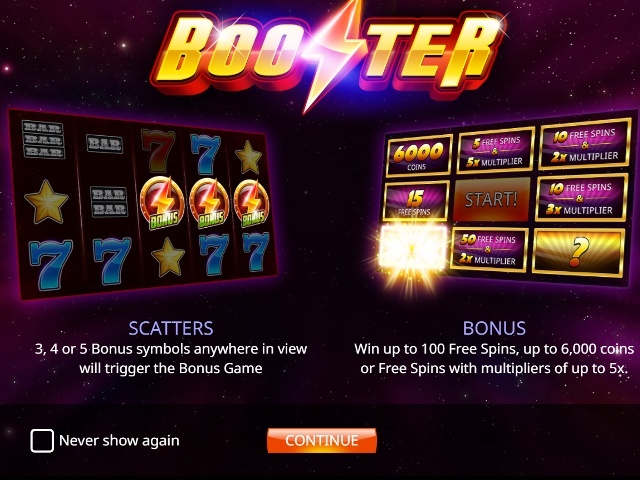 Fire up your rocket as we guide you through how to play the game in our Booster slot review. Play Booster for Real Money! 120 Extra Spins on Starburst! PartyCasino is part of the Bwin.Party family of gaming hubs, most famous for online poker mainstay PartyPoker. Boasting years of industry experience as well as a desire to stay on top of industry trends, PartyCasino is a stellar entry in the online casino industry! 100% Bonus up to £100 + 30 Extra Spins on Starburst! New players only. Deposit min £10 & get 100% bonus (max £100) & 30 Free Spins [FS] available on specific games for 7 days. FS wins are granted in games bonus after all FS are used. Bonus wins capped at £400 exc. JP wins. To withdraw games bonus & related wins, wager 30x the amount of bonus. Wagering reqs. vary by game. Deposit balance can be withdrawn at any time. Withdrawal restrictions & full T&C's apply. Hitting the screen in 2016, this ultra-modern casino has been serving high-end slots, jackpots and table games ever since! Designed for mobile play, Wink Slots is everything you could want from an online casino this year! Despite having a futuristic, sci-fi theme, Booster is quite old-fashioned in how it looks and its gameplay. The graphics are fairly simple with the moving stars in the background being the most advanced element. 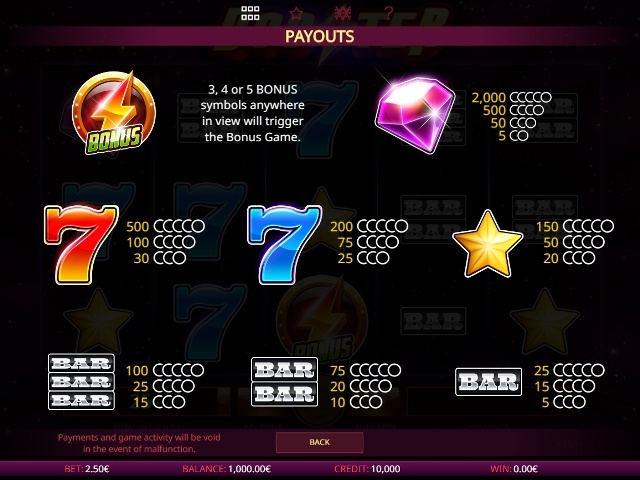 Old-school fruit machine fans will love the game's classic symbols, including BARs and lucky 7s. Excluding the scatter, there are actually only seven different symbols on the reels – the most lucrative of which is the diamond, paying out 2000 coins for landing five on a payline. The diamond is also the only symbol that pays out for landing two symbols, even if it is only five coins. The single, double and treble bars are the lowest value symbols. All 25 paylines are permanently enabled and there are 25 coins in play. All you have to do is choose your coin value between 1p and £1, a minimum bet of 25p and a maximum of £25. The gameplay moves along pretty quickly and a little jingle accompanies each win, with the winning symbols lit up. There's also an Auto Spin function allowing you to run between five and 100 automatic spins. You can set the Auto Spin to stop when you reach a certain loss or win limit. 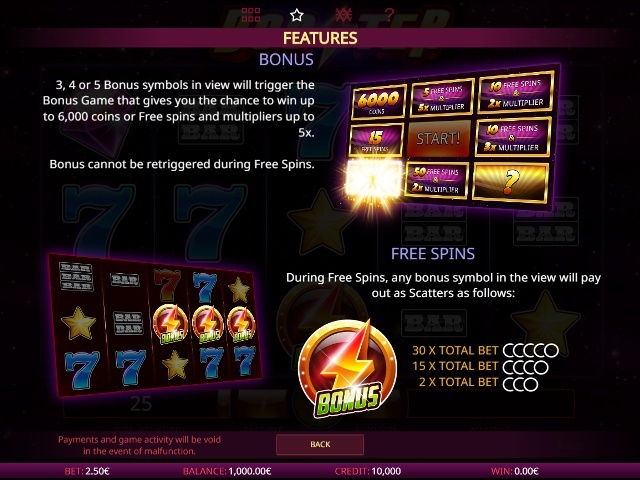 During free spins, the feature cannot be retriggered but instead, the bonus symbol will pay out as a scatter with three symbols awarding you with 2x your total bet, four getting you 15x your total bet and five scooping you a prize worth 30x your total bet – that’s a top potential prize of £750 when playing at the maximum bet amount. 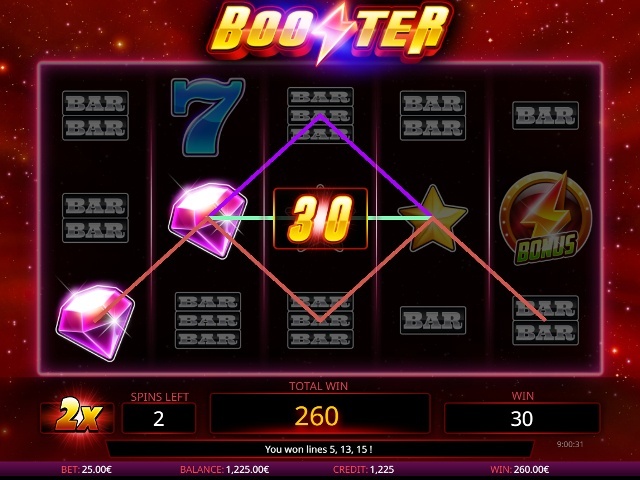 For those who like simple, old-fashioned, fruity online slots, Booster is definitely a game worth jumping on. Let's have lift off! Share this Booster Review today! If you like Booster, you'll love these slot titles too!